Lots of elements of the road environment on Campkin Road, Cambridge, are in a poor state of repair. I recently reported some of the issues via FixMyStreet which makes it easy to alert the relevant councils to problems. Can you spot the stealth road hump? As you enter Campkin Road from Arbury Road you are met with stealth speed hump. 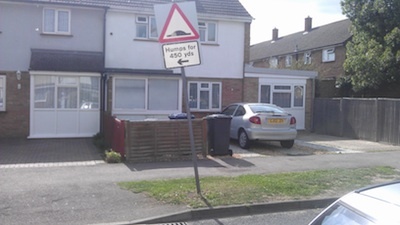 Speed humps are usually well marked however this one blends into the background; the first an inattentive driver might know of it is when the under-side of their car is scraped. The hump bears the scars of many collisions with cars and I recently observed a police car smash straight into it (most people in anything smaller than a bus drive two wheels over it to avoid grounding on the hump). I think this hump used to be made of brick. 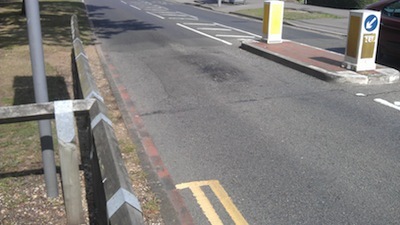 I repeatedly ask why councillors specify bricks for use on roads, especially those like Campkin Road which are bus routes and where the road has to stand up to heavy vehicles, as the bricks rapidly fail and need to be replaced (such work is constantly needed on Sidney Street in Cambridge for example). I think the council have patched this hump on Campkin Road up by covering it in tarmac. The hump needs a white triangle painted on it; adding the other road markings generally associated with such road humps would be a good idea too. The hump has been in a stealth state for quite some time. The road sign pointing to the Campkin Road Car Park in Cambridge has deteriorated to the point where it has become illegible. 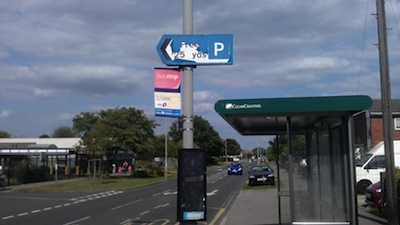 The poor state of the sign detracts from the appearance of the area; it gives the impression that local residents and their elected representatives don’t care about the quality of their local environment. Without the sign users of the nearby community centre, doctors surgery and city council office might not be aware the car park is free and open to the public. 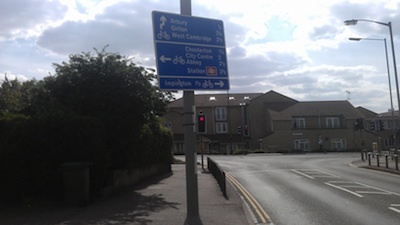 The cycle direction sign on Campkin Road Cambridge on the approach to the junction with Arbury Road is askew. Alone this isn’t a notable problem but many of the roadsigns in the area are similarly jauntily angled and taken together the state of them detracts from the appearance of the area, and in many cases makes the signs hard or impossible for their intended audiences to read. Hopefully soon, when the Science Park Station opens, these signs will need to be renewed as signs to the station in North Cambridge will have to be clear which one they mean. 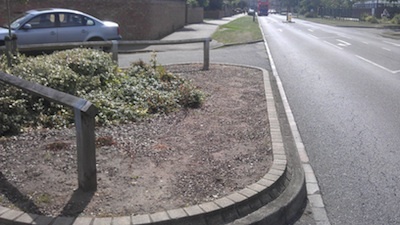 There is bare earth where municipal planting has deteriorated in the planter shown on Campkin Road in Cambridge. The planter is an opportunity to really brighten up the street. I expect people are currently walking across the planter and extending the wooden bar around the entire area might help new plants get established. 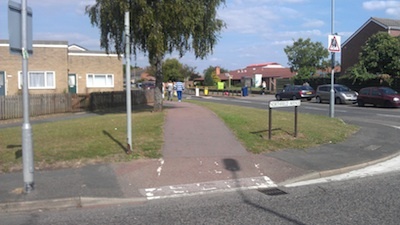 At the start of the shared use cycleway/pavement on Campkin Road Cambridge near the junction with Northfield Avenue the cycle/shared use sign which should be on the post is not present and the markings on the ground have deteriorated to such a state they are illegible. These kinds of missing signs lead to people being confused as to if they can cycle on a path or not; they can also lead to people complaining about cycling on the pavement, not appreciating that it is legal. At the Campkin Road Crowland Way junction in Cambridge there is road signage in a very poor state. The shared use cycleway end sign has deteriorated and is at a jaunty angle. The Crowland Way sign is broken and also not straight. A lot of signage in the area is in a similar state; detracting from the appearance of the area, making it look very uncared for. 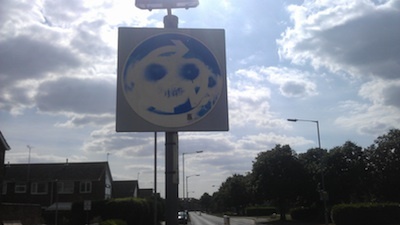 The roundabout sign on Campkin Road approaching the junction with Northfields Avenue has been in a graffitied state for years. The graffiti makes the sign hard to read, and detracts from the appearance of the area making it look lawless and unloved. 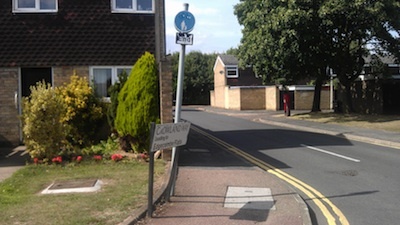 A road narrowing sign on Campkin Road near the junction with Northfields Avenue does not face oncoming traffic as intended; it is 90 degrees or so out rendering it useless. Many signs in the area are similarly wrongly angled making the road environment look poorly maintained and uncared for. 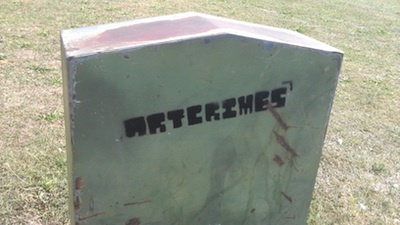 There is graffiti on a telecoms box on Campkin Road near the community centre and junction with Northfields Avenue. 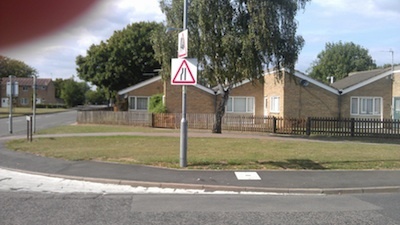 Signage for the roundabout, and warning of road humps, at the Hawkins Road – Campkin Road junction is not facing traffic as intended. Signage on Hawkins Road warning of humps on Campkin Road is not facing traffic as intended, it is approximately 90 degrees out. 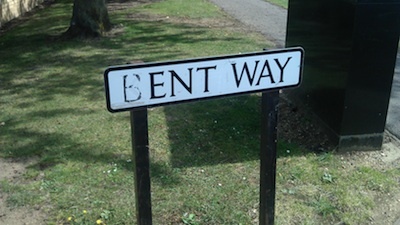 The sign for Kent Way at its junction with Hawkins Road in Cambridge has been defaced. 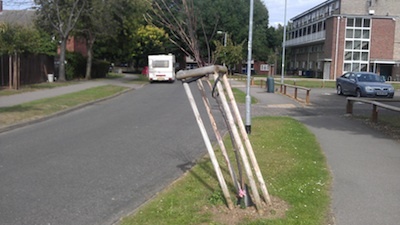 A relatively newly planted tree and its associated tree guard on Hawkins Way in Cambridge is significantly askew, leaning towards the road. There is a large telecoms box in the cycle path outside the Grove School on Campkin Road in Cambridge; this is far from ideal. This problem was noted six years ago. I think King’s Hedges needs better councillors who will insist the local councils keep the area in good nick. Cyclists Branded Anti-Social For Trying to Stay Alive – includes reports of many problems with signage etc. on Milton Road. It’s almost a year now since I raised many issues on Milton Road and we’ve seen no sign of the promised “fight” in relation to those; will her performance be any better in relation to Campkin Road? While I’ve not yet had any substantive response from either council or any of my councillors about the matters I’ve raised I’ve had a reply from Cambridge City Council’s “Street Champions Coordinator” who tweets with the city council logo so presumably is a City Council Officer. The officer, Stuart Elliott-Smith, doesn’t promise any action but merely expresses “hope” that my reports are followed up. I will write back and ask if he can do anything more proactive than merely “hope”. The council may even have two Street Champion Co-ordinators as a Kings Hedges council newsletter from Spring 2013 referred to Rachel Hickey (Street Champion Co-ordinator) . Maybe we have a “Street Champion Co-ordinator” to co-ordinate the project and a “Street Champions Co-ordinator” to work with volunteers? On the first right as you turn from Campkin road to Northfield avenue the telecoms box is almost constantly on its side. Occasionally someone ‘fixes’ it by putting it upright again but within a week it’s bent over again with wires/electronics exposed. 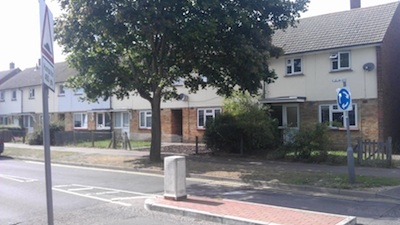 Also I have repeatedly asked on Twitter (@camcitco) where I can find plans for the Campkin Rd redevelopment but I haven’t been sent any information and a Google finds little of help. 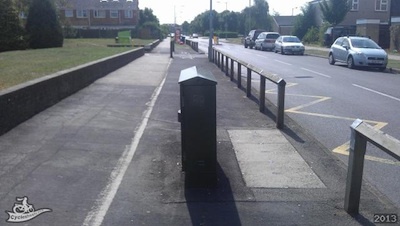 The local councillor is now chasing up the cycle related aspects of these works, and the North Area Committee chair has promised to keep the matter on the committee’s action sheet until it is resolved.